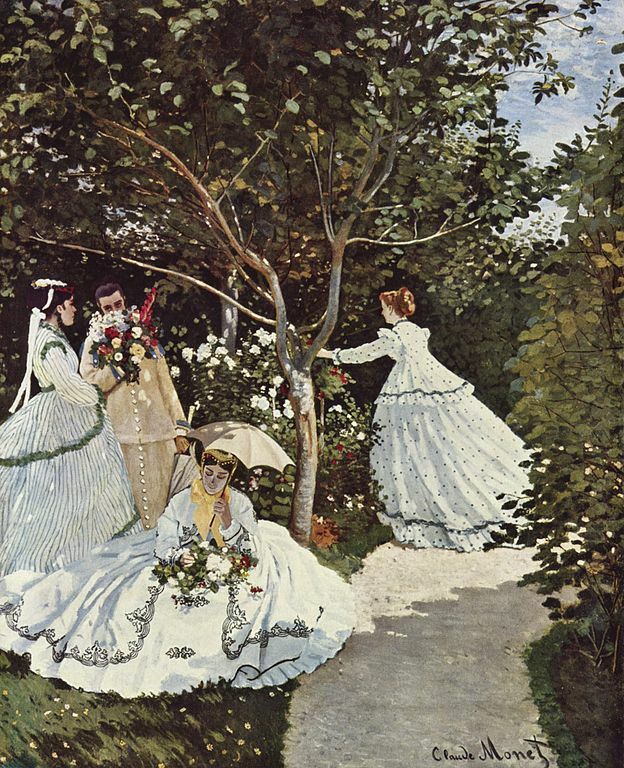 Women in the Garden by Claude Monet is a large impressionistic painting completed in 1867. It is one of his earlier works, done at a time when Impressionistic painting was not held in high regard by the art community in Paris. Although this work’s impressionistic style is not as refined as later works by Monet, it is still held as a well-regarded piece by the Musee d’Orsay, where it currently resides. A garden scene shows four people enjoying nature. In the foreground, a woman in a white dress with black trim is sitting next to a winding path. She holds a pale umbrella over her head and her lap is full of flowers. Behind her, a woman and a man stand together. The woman is wearing a white dress with green stripes and is shown in profile. The man wears a long tan coat. His face is partially obscured by a gigantic bouquet of mixed flowers. On the right side of the work, another woman in white dotted gown lifted by a breeze reaches out to pick more flowers. She is shown in back profile. All the figures are surrounded by trees, flowers and grass with a little blue sky showing in the upper right. The painting is a little over 100 inches tall and 80 inches wide. Camille Doncieux was the model for all three female figures in the painting. Doncieux was Monet’s model, mistress, and later his wife. At the time, Monet was extremely impoverished. He copied the various dresses from fashion plates as he couldn’t afford to dress and re-dress his model. The huge painting, done outside, reputedly required Monet to dig a trench as he worked on the lower half so that he could maintain the painting’s perspective without having to kneel or crouch. With Women in the Garden, Monet begun to work with the color and shadow theories that would influence his later work.